Candidate must possess at least a high school diploma or at least with equivalent experience; With at least 2 to 5 years of cooking experience; Must be knowledgeable with Korean cuisine. Candidate must possess at least a high school diploma or at least with equivalent experience; With at least 6 months to 1 year experience in similar role; With knowledge of Korean cuisine. Male/Female, 18 to 28 years old; At least college level; With or without experience. Male/Female, 18 to 28 years old; Must possess at least a high school diploma; With or without experience. Candidate must be at least college level; Must be 18 to 28 years old; With or without experience. 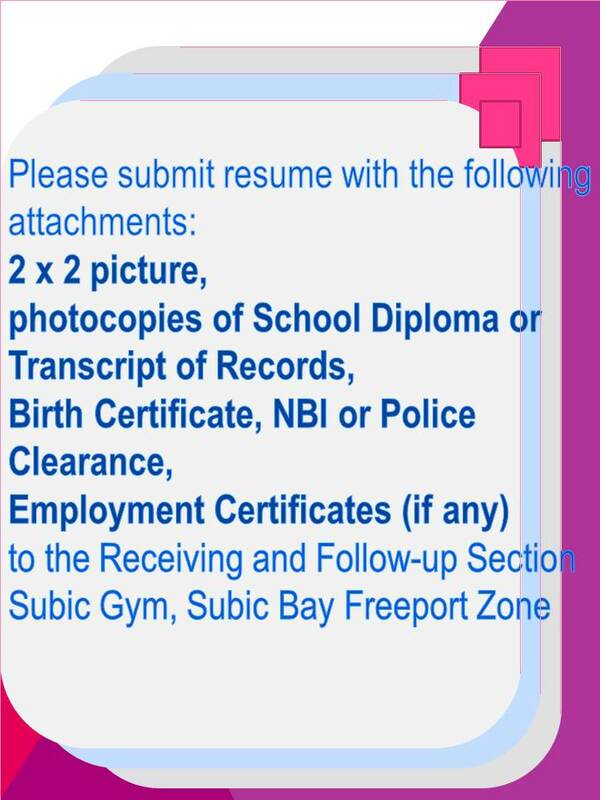 Male, not more than 35 years old; Must be a Licensed Mechanical/Metallurgical Engineer; With experience working in a heat treatment facility; Has excellent communication skills; Has competent computer skills, especially with MS Word, Excel and Access; Must be willing to relocate in Subic.